Washington Gov. Christine Gregoire, one of the founding members of the Western Climate Initiative which has co-opted the staff of the Western Governors Association to do WCI work, has engaged in a pattern of deceit and has circumvented the state legislature to advance her global warming agenda. 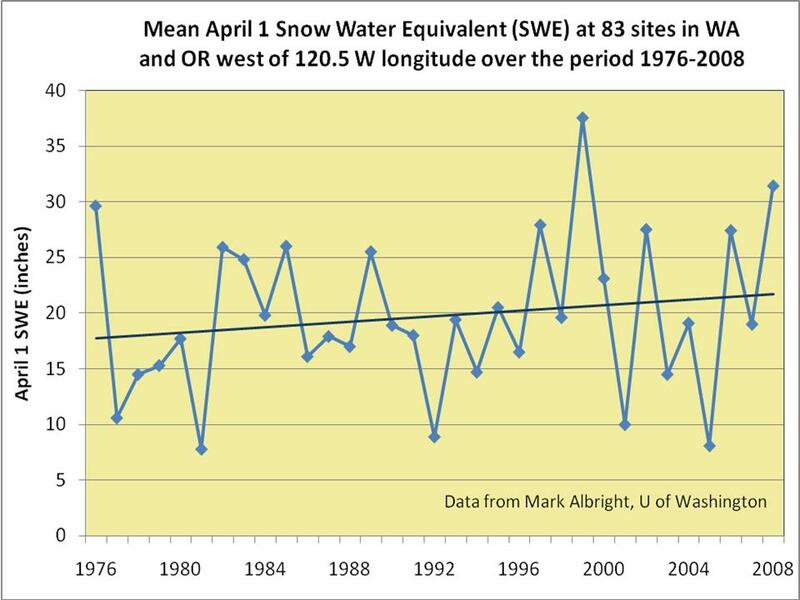 Actual snow pack numbers show a 22 percent INCREASE in snow pack over the past 33 years across the Washington and Oregon Cascade Mountains. “The use of snow pack trends from 1950 through current suggests a much different (steeper) trend than if period of record measurements are used. Granted, there exist relatively few stations that extend back prior to 1940, but those stations whose records are available make it clear than monotonic decreases in snow pack do not occur through the entire period of record. Pretty brazen for a narrowly elected governor, whose state economy would suffer (as would all of them) under cap-and-trade. Clearly by begging her state’s delegation to pass Waxman-Markey, she is hoping that the federal government will absolve her of any blame for the consequences such a program will bring.